IND architects has created an art deco inspired office space for VTB Bank located in Moscow, Russia. 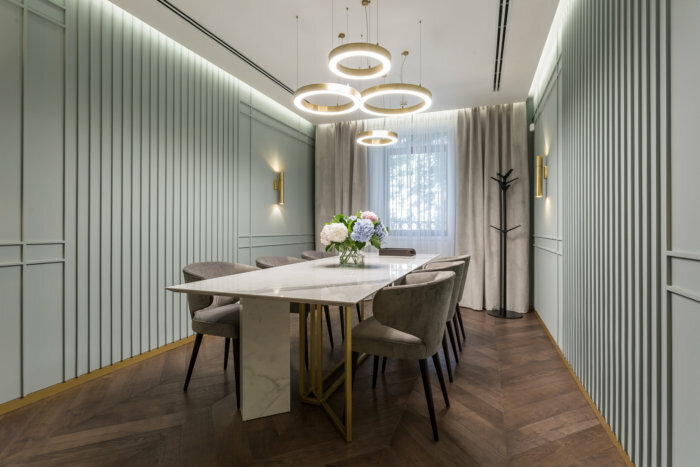 Luxurious materials, careful attention to details, and combination of various textures make the interior elegant and worth attention of financiers and their wealthy clients. The interior concept presents the office as a liner in the sea of business. This metaphor is reflected in the style choice: the huge splendid liners cruising between Europe and America in the last century were mostly executed in the art deco style. It sounds also in the names of meeting rooms: each of the seven meeting rooms bears the name of a famous liner. It is notable that the bank clients duly appreciated not only the comfort and the interior of the office, but also the original approach to the general concept and names of the meeting rooms. In the interior, calm, natural color range prevails, which is full of details making the space splendid, finished and really luxurious. The precious materials emphasize the status of the office and its clients. Ethnic motives, diverse textures create an individual style in each room of the office. Every room is unique and is not similar to the others. The link is the light, spacious corridor with glazed brass-finished doors. Some meeting rooms are cozy, with heavy velvet curtains, soft velvet-upholstered furniture, warm wall color and attractive details. Others are more stringent, with a capacious desk and reserved colors, but again with luxurious soft furniture. Many rooms dispose of a fireplace, making the environment warm and friendly, which sometimes lack in a city rushing forward.